Lemon bars are a classic dessert that twist the traditional notation of desserts by combining sweetness with a delicious citrus zing. The classic shortbread crust adds the perfect light base that is sure to melt in your mouth. *The butter should be chilled, but still slightly pliable. To achieve this effect, I keep my butter in the fridge at let warm on the counter for 5-10 mins before cutting. The butter should easily cut and not crumble. Preheat the oven to 400F. Line a 9×13 inch baking pan with parchment paper by cutting slits into the corners to align to the corners of the pan. This will allow for the parchment paper to sit flat. In a food processor or blender, combine the flour, corn starch, icing sugar and salt. Pulse for 30 secs to combine. Add the butter cubes and blend until the flour mixture is dampened, about 30 secs – 1 min. It should stick when pinched between your fingers and may resemble small peas or coarse meal. Dump the crust mixture into the lined baking sheet. Press firmly on the mixture with your hands to create an even pressed crust. Place in the oven to bake. After 5 mins, reduce the temperature to 325F and bake until the edges are golden brown, about 10-15 mins. Remove from the oven and set aside. While the crust is cooling, make the filling. In a large bowl, whisk together the eggs, sugar, flour, salt, lemon juice and lemon zest. While whisking, slowly add the cream until fully combined. Pour the filling onto the warm crust (ensure the crust is warm, but not searing hot. If if the crust is too warm, it will separate the filling) and place back in the oven. Bake until the filling is firm and no longer giggles in the middle, about 30 mins. Remove from the oven and place the baking sheet on a wire rack to cool. Once cool, use the parchment paper to lift the lemon bars out onto a large cutting board. 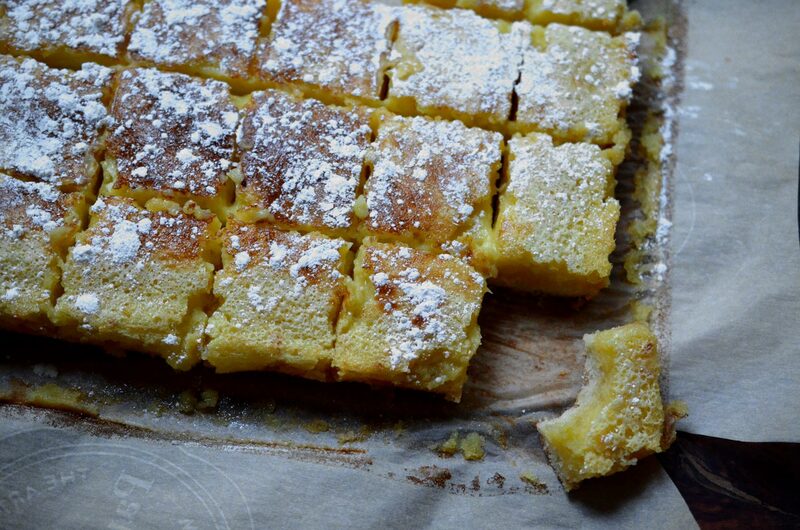 Using a knife or pizza cutter, cut the lemon bars into serving-sized pieces. Store in the fridge until ready to serve. These bars are so amazingly delicious, a great kick of lemon it gives your tongue a tingle.